How do we get to your office? Where do I park? We recommend public transit to reach our office. 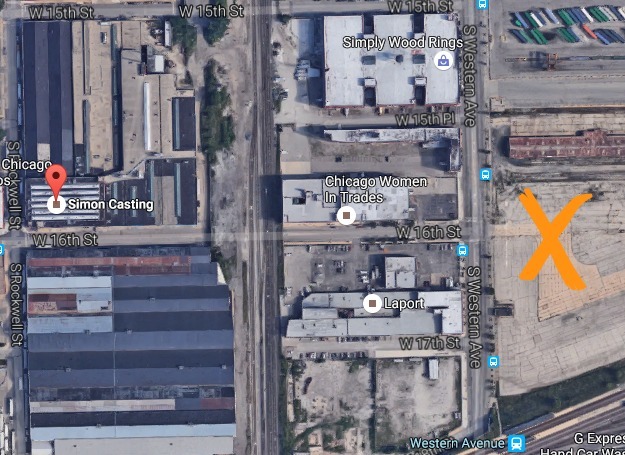 The CTA Pink Line Western stop is about a 10 minute walk from our office. The 16th-18th bus (18), Western bus (49), South California bus (94), and Streeterville/Taylor bus (157), will also bring you very close to our office. Lot parking is very limited at Cinespace. You may park at the parking lot at 16th Street and Western (please see our map below - X marks the spot!). It's the giant lot on the east side of western - the address is 1601 S. Western @ 16th Street. Driving on 16th headed east, simply stay on 16th and drive directly into the lot. Leave your name and number on your dash and a note that you're at CLAIRE SIMON CASTING. Please do not park in any of the other lots - any illegally parked cars in the lots at Cinespace will be towed immediately with no warning. How do I submit for upcoming casting opportunities? 2558 W 16th St, 5th Fl. Do you have any open calls or auditions? We do hold general auditions a few times a year to see new talent from mailed-in or agency submissions. On occasion, we'll open our search to the general public for various projects, and always publicize the details online. So be sure to like us on Facebook to stay up-to-date! Do I have to have acting experience to be considered? Not necessarily, though we cast actors with experience and agency representation most often. If you have a specific look or skill set we need, we'll keep your headshot on file and get in touch if we'd like to see you for an audition. Are you a talent agency? Can I be represented? As a casting office, we work closely with the agencies in town but do not represent talent. When we have a project to cast, we send the information to the agents who then submit the talent they represent to us for consideration. Agents are the go-between between you as an actor and the projects we cast. The Chicago Creative Directory and Screen Actors Guild are two great resources for agency information. Most agencies list their specific submission guidelines on their websites as they may not all be the same. Once you're signed with an agent, they'll handle submitting you to us for projects. We work through them to schedule your audition and book you for jobs. Any guidelines for choosing an agent? Make sure your agency only receives a commission when you book a job and doesn't charge any up-front fees for representation. Though costs for professional headshots and training are your responsibility to build your career, you should not be required to shoot or train with anyone specific though your agent can recommend various reputable options. Otherwise, choose an agent with whom you feel most comfortable and who believes in you. It's an exciting and rewarding partnership! Your headshot is the first thing we see when determining whether or not we want to see you for a project, so its importance is paramount. There are several great headshot photographers in town and with a little research, advice from other actors or your agent, you'll find the perfect fit. Make sure your shot is an accurate representation of your current look, isn't too made-up, retouched, or stylized, and shows depth of personality! Headshots that feature a bit of torso are also helpful to give us an idea of your build. Taking classes to learn your craft and keep your skills sharp is extremely important. It builds your resume which attracts interest from agents and casting directors and keeps you ready between auditions. Even actors who regularly perform on stage and in Film/TV continue to train and stay in shape creatively. If you're a new actor, start with beginning acting classes and continue to build a well-rounded resume from there. Once you've gotten some on-camera training under your belt, for example, perhaps consider improv training as it is extremely helpful for commercial auditions, among other projects. There are excellent classes for theater, stage combat, sketch comedy, scene study, and more. Some acting schools also offer private coaching to help you prepare for specific auditions. To sum it up: if you want this career to work for you, you'll need to work for your career. Make the investment. You're worth it! Any other ways I can get in front of you? Yes! We love our Chicago theater scene and try to see as many shows as we can to scout for new talent. If you're in a play, improv show, doing great standup, etc, mail us an invitation along with the dates, run time, and who we should contact for tickets and we'll see if we can make it. Feel free to send us information on film premieres as well. We look forward to seeing you perform! Our annual Meals For Monologues event is another great way to be seen - keep an eye on our website and social media accounts for more information! I have an audition! Anything I should know? How can I stand out? Arrive 10-15 minutes early. Please don't be late! If you are late, please call your agent or if you're unrepresented call us and let us know when we can expect you and we'll see if we can still accommodate you. Always bring a properly stapled headshot/resume. It is true some first-round commercial auditions or pre-reads for TV/theater don't require them, but we always need them when a client or director is present and you may not always know when that is the case. We no longer print actor headshots when you forget yours. Short story: always bring one! Be aware of scheduling conflicts. Pay close attention to the project dates listed on the sign-in sheet and be sure to write down any conflicts you are unwilling to get out of (even if it means possibly losing the job). If you're able to get out of it, don't write it down. It goes without saying but can't be overstated: prepare your material well! Always aim for full memorization even though you may have received the sides last minute. Rehearse with friends, work with a coach, etc. The more prepared you are the more you'll be able to relax, listen for adjustments, and nail it!